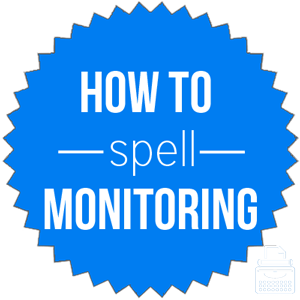 Spelling of Monitoring: Monitoring is spelled m-o-n-i-t-o-r-i-n-g. Definition of Monitoring: Monitoring is the present participle and the gerund of the verb monitor. To monitor means to observe or to check the progress or quality of something over time. Monitoring is the act of maintaining regular surveillance or review of someone or something. What does monitoring mean? Monitoring can function as a verb as it is the present participle of the verb “monitor,” and it can function as a gerund, acting like a noun. As the present participle of monitor, monitoring means the ongoing act of observing, checking, or surveilling of and reporting on someone, something, or some activity. We are monitoring the situation and will provide any updates as soon as we receive them. The police asked to speak to the person who was monitoring the images from the security cameras. As the gerund of “monitor,” monitoring acts a noun referring to the state of observing or surveilling something or someone, or the act of being a monitor of something. The monitoring of this operation has been weak and inconsistent, thus I am putting someone else in charge of the process. His constant monitoring of her private conversations led to a serious argument. While there are no common phrases or idioms that use monitoring, there are some phrases and idioms that might be used in place of this word. Keep an eye on: to watch someone or something or stay informed about one’s behavior. Keep track of: actively keep an account of, so one is well informed about something; usually involving routine monitoring or surveilling. Monitoring is the present participle and gerund of monitor, which was first used in 1530, according to Merriam-Webster’s. Monitor comes from monit-, warned, which comes from the Latin verb, monere, meaning to warn. Monitoring can act as a noun or verb as it is both the present participle and gerund form of the verb monitor.